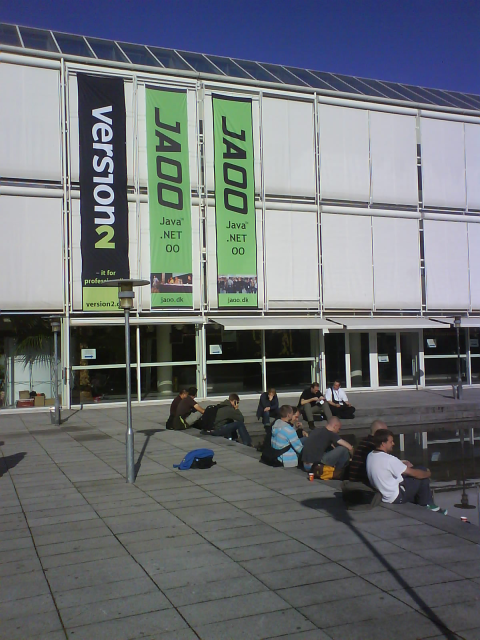 JAOO2007 is over, and I’m back from one day of tutorial and three days of conference. Got to see a lot of stuff, hear some great people, and talk to other developers and it-professionals. Didn’t quite get to see as much as hoped for, since working as crew this year definitely took more of my time than last year. As previously said here I was participating in Diana Larsons “Leading Agile Retrospectives” tutorial. The tutorial was held Sunday before the conference and was joined by about 25 people. We were split in four groups and used the time before the lunch break for presentations and performing a simulated retrospective in the groups, with Diana as a leader. The goal was to try out some different techniques and the discuss how each group felt about using the technique and what results were achieved. After lunch we worked with in groups again, analysing a “case” and coming up with a plan for a retrospective. Our group had a hard one, with a 20 people team using 30 day iterations, not currently using retrospectives and a completely failed project. Now the VP of the organisation had decreed the need for a project post-mortem, and everybody were suspecting that the board were out looking for somebody to blame. It was a challenge coming up with a retrospective that would convince the team that it was not about blame, but more about what to do better. We made quite a good plan, which I’ll try to write up and publish here later. Anyway… the tutorial was definitely the best thing about JAOO2007 seen from my perspective. It was the first time I participated in one, and next year, I’ll try to get to participate in all three days. The conference it self wasn’t bad of course. There were some really good speakers, and the exhibitors who had found their way to the main hall of the conference area, genuinely had some good products to show, and were willing to talk about technical stuff, and not just marketspeech. and several others. Sadalage, Osherove and Bolognese immediately got to have their blogs added to my feed-reader. Gabrielle Benefield gave a very good presentation but doesn’t seem to have blog, most unfortunately. The best speaker I heard at JAOO2007 was probably Roy Osherove, who both had some neat techniques to show, but also held the entire audience at his presentation awake and focussed with his style and humour. 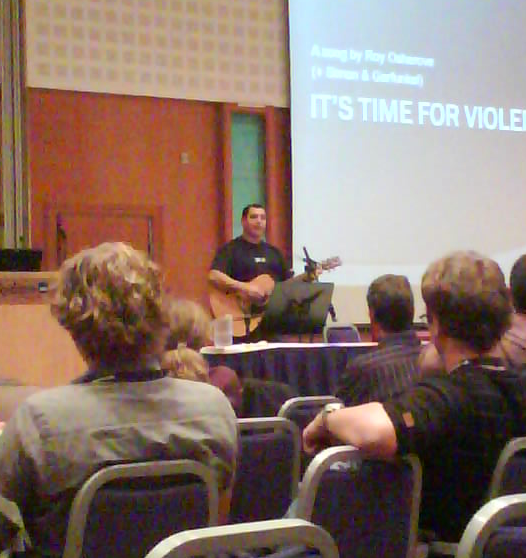 He ended his session with a small performance by him self on guitar, singing a tune about database design. Fantastic. Luca Bolognese also had a very good mix of humour and coding in his presentation. He had 3 slides and then proceeded by writing code in a tweaked Visual Studio 2008 for 50 minutes. And everybody was kept focused throughout the entire session. Mads Torgensen actually used the same style, but Bolognese was the master of the new dicipline “codetainment”. In addition I had the opportunity to hear Robert C. Martin (Uncle Bob) talk about applying craftsmanship to programming. Don’t know how useful it was, but Uncle Bob is very entertaining, and has some very strong opinions on rules every developer should “live” by. 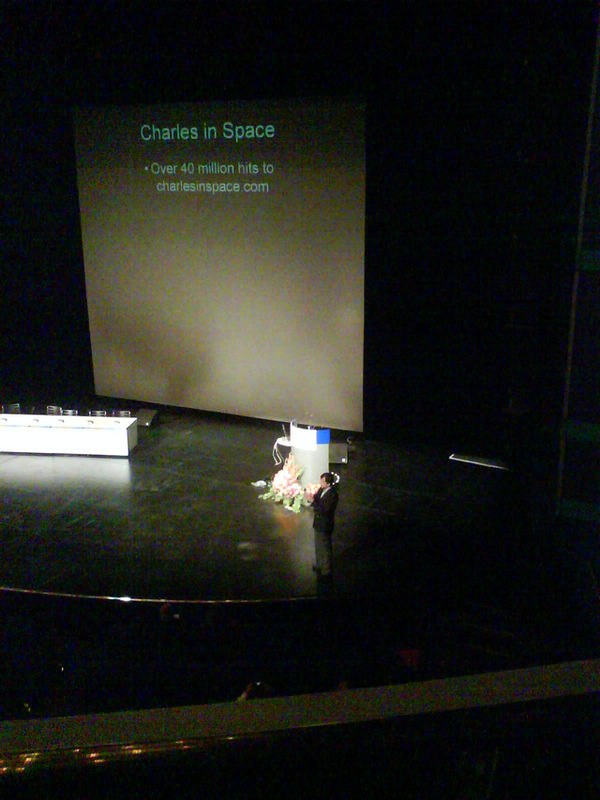 Charles Simonyi (inventor of Word and Excel) shows slides from his tour to space. 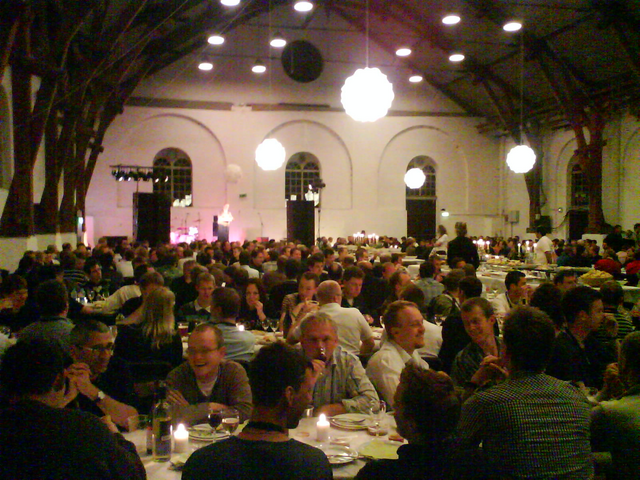 Ridehuset, the main food and party area. Monday night conference party. 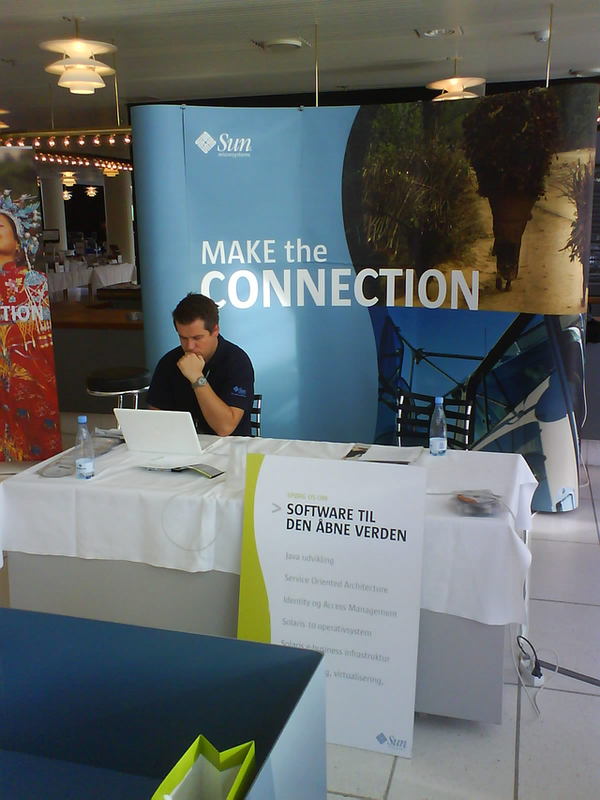 The Sun Campus Ambassador from SDU being busy…. 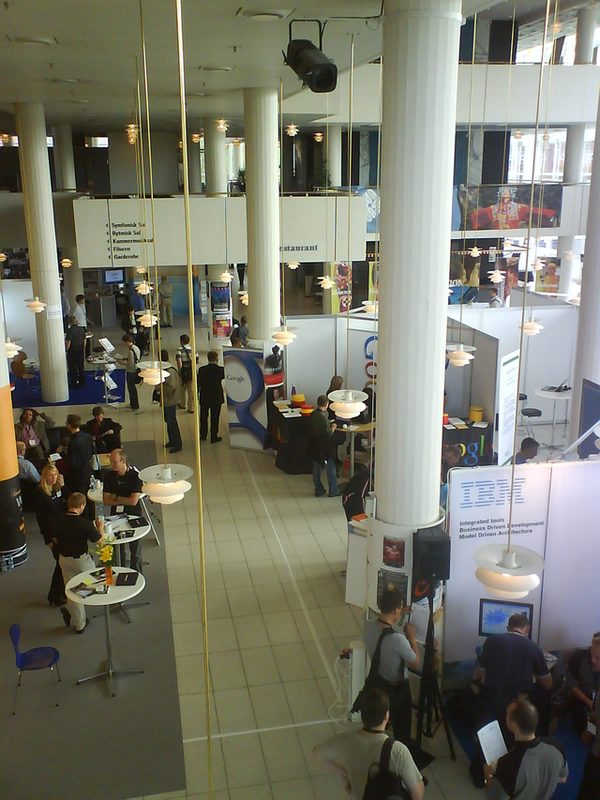 Part of the exhibition area, IBM and Google booths in the foreground. Well, that was JAOO2007. Already looking forward to 2008, with even more tutorials for me.